Over 100 quilts have been made for Mission Australia and The Exodus Foundation by a dedicated group of staff and students from the University of Western Sydney. Both of these charities are well regarded in the community but in these difficult financial times, struggle constantly to keep funding happening. One of the students involved in this venture has contacted our guild to help advertise their novel approach to a worthy cause. 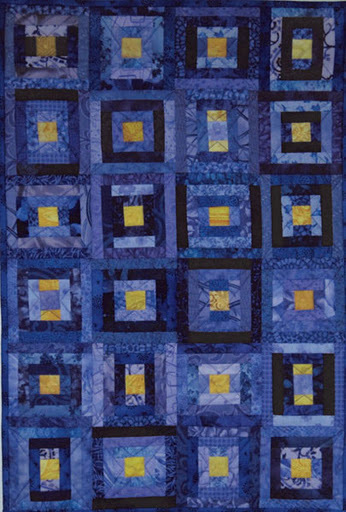 The guild member who will share her quilting journey in November is Jessie Hosie. Jessie works in the CBD and often visits the Guild's Office during lunchtimes, thus many members will know her. Currently she is creating the wonderful 30th Year Signature Coverlet from all of the signature blocks that members and June Quilt Show attendees contributed towards. 'Iris Steps' by Jessie Hosie . . . Purple and Yellow 2011 Guild Challenge entry. Come and hear how Jessie caught the quilting bug and see her lovely work. Where : The Office of The Quilters' Guild of NSW Inc. There is usually "squeezing-room-only" during Friday Showcase as can be seen at the September morning of Lis Cook's Showcase. Once the floor talk is over, any previous display is removed from walls and several quilts from the current 'showcaser' are then hung for the following month, for all volunteers and visitors to the Guild's office, to enjoy. It is time to book now for this great weekend of quilting activities. Our journey starts with a pick up on the North Shore, Strathfield Railway Station and Sutherland Railway Station. We will make our way slowly to Goulburn stopping along the way in Mittagong and Berrrima to name two towns. Look out for the discounts that the stores we visit are offering to us. Accommodation will be for two nights at the Best Western Centretown Goulburn, enjoying 'Continental Breakfast' and dinner for the entire stay. A free morning has been scheduled to allow you to spend the time in the hotel pool and spa, or shop at the market and stores in Goulburn. The Guild meeting is on Saturday afternoon hosted by the Goulburn and District Patchworkers and Quilters Group. Notification of the Guest speaker will be in further updates. Activities are being planned for Saturday evening. On Sunday we will make our way back to Sydney via Wollongong, stopping along the way. The cost of the three day event is estimated at $340.00 per person twin share with an additional fee of $150.00 for a single room. This price includes accommodation, breakfast and dinner. A deposit of $100.00 is required with your booking form. A booking form will be available on the website soon. Closing date 14 January 2013 and final payment is required by 28 January 2013. You will be notified of any changes or adjustments in costing. The approximate costing is dependent on the total number of people travelling on the coach and subject to cancellation if we don’t get the numbers. Any enquiries contact Rhonda Langhorne at office@quiltersguildnsw.com or ring the office on 02 9283 3737. Can you help construct our coverlet please? Many Guild members have this year donated signature blocks for this 30th Anniversary Commemorative Coverlet. Blocks were on display at the Sydney Quilt Show in June, and all attendees were able to add their signature, for posterity. These blocks have now been squared up and there are to be two sewing days for coverlet construction. November 17th : Venue : Pegs Pieces, 138 Oak Road, Kirrawee. November 26th : Venue : Meg Orr's home, 19/62 Norfolk Road, Epping. Please bring your sewing machine, and lunch. No need to sew all day, even to "pop-in" for a short session will be a huge help to the members who have been the stalwarts of this project. All members and those who have been connected with the NSW and Sth Australian Quilting communities over the past 30 years have been saddened to learn of the untimely death of John Gebhardt on October 6. John was the ever supportive husband of our current President of The Quilters' Guild Of NSW Inc., Maree Gebhardt. The Guild Community send their sincere thoughts and sympathies to Maree, their daughters and family. First in . . Best Dressed . . . The Quilters Guild of NSW Inc. is fortunate to have hard working members and a committee committed to inspiring all quilters to push their boundaries with techniques and creativity. Workshops and guest speakers are organised well in advance, as many teachers have their schedules committed to a year and more. Two teachers of international renown are Pam Holland and Gloria Loughman. Pam's 'Thread Painting' W/Shop had potential attendees being listed a year ago, so it is no surprise her September w/shop was booked out months ago. Similarly, Gloria's upcoming 19 & 20 October W/Shop entitled 'Light up Your Landscape' is fully booked, however it never hurts to go on a "waiting list"
Recently Jenny Bacon spoke to 20 members about "What the Judges are Looking For" and a 'wait listed' member was able to participate at the last minute. The Guild Website and The Template (published quarterly) are the places to find workshop details. It is always prudent to book workshops early to avoid missing out on the inspiring classes that the Guild is committed to offering. Guild Members in the Guild's Office learning some of the tips to Quilt Judging from Jenny Bacon during her 3 hour w/shop in September. All agreed that her knowledge is priceless, as the talk was extremely informative . Notice is hereby given of the Annual General Meeting 2012 of The Quilters' Guild of NSW Inc. to be held on Saturday October 13 in 'The Dome" at Burwood RSL, Shaftsbury Road, Burwood. The Guest Speaker will be Barbara Gower. The Retrospective Interview panel will be Trudy Brodie, Shirley Gibson and Judy Hooworth. There be the usual Members 'Show and Tell', with this year's Challenge quilts : "Pearl" to be viewed for the first time, Viewers Choice to be chosen and winners to be announced. There are 55 quilts entered, taking inspiration from this year's 30th Birthday theme. The immediate past committee will be thanked for all of their selfless help in continuing the aims and challenges of steering this wonderful organisation, and the new committee will be welcomed. As always, please bring your own mug for afternoon tea. This is the fabulous colour combination for the current "Block of the Quarter"
The block is composed of rectangles and the Flying Geese patchwork unit, needing turquoise and purple prints, and a cream solid. Many blocks will make an extremely striking quilt top! As always "winner takes all" when they are part of the draw at the Burwood meeting of The Quilters' Guild of NSW Inc. Please send in a block or two to be in the draw. Self named blocks need to reach the Guild Office by Tuesday 9 October for the AGM the following weekend. At the Guild's August meeting, Wailyn Mar, Template Editor, very deservedly "won" all of the red, black and white "Spool" blocks ... enough for quite a large quilt top. There is time still to raid the stash and whip up a Louisiana block this weekend! Country Quilting Exhibitions : mid October. Rural members and visiting 'cityslickers' are invited to attend 2 upcoming quilting exhibitions. Entitled "A Celebration of Community" this quilt show will display Exhibition and Challenge quilts, have free workshops, and a Merchants area. There are just a few weeks until the Annual Guild Retreat, with members already registered planning for a wonderful weekend of companionship, food and relaxation, having plenty of time to quilt and create. Attendees work on their own projects, at their own pace.... no workshops or classes, no cooking, no stress! Perhaps you are considering joining others at the retreat? Please be aware that there is a deadline for lodging your booking form and payment. Page 39 of The Template Aug 2012 has the necessary Retreat Information and the Booking Form. Please don't miss out on this enjoyable weekend of productivity.